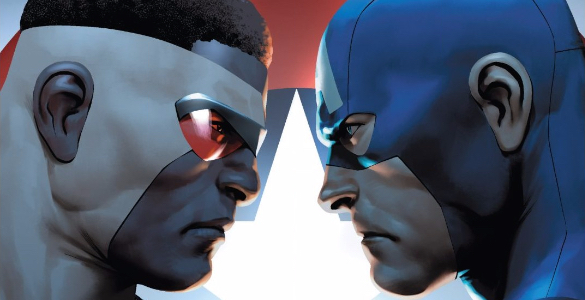 Like a meta comic book continuity retcon, Sam Wilson and Steve Rogers’ Captain America titles collapse into one in Captain America 25. One of the last times Marvel published a Captain America 25, Steve Rogers was shot “dead.” While this issue might not be as monumental as “The Death of Captain America,” it is a book that is almost essential as a Secret Empire tie-in. 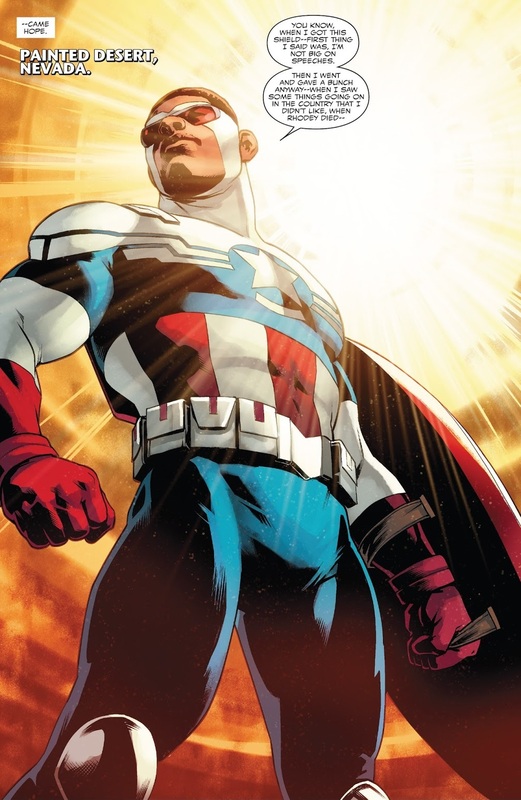 While Hydra Supreme Steve Rogers appears briefly at the beginning, the majority of the Captain America 25 is dedicated to Sam Wilson and The Resistance. The Resistance’s second (third, fourth?) wind is reliant on Sam “not big on speeches” Wilson’s rallying speech. I love that Jesus Saiz’s establishing image for this is a clear visual homage to Rick Remender and Stuart Immonen’s All-New Captain America 1 — the first full issue of Sam Wilson as Captain America. Nick Spencer takes the opportunity to explain the Miles/Steve Secret Empire 7 showdown here with a bit of Cosmic Cube fragment ex machina. He also brings back a blink-and-you-miss-it Inhuman character from the early chapters of Secret Empire affectionately named here as “Barf.” Knowing that Steve altered his fate with a fragment, our heroes enlist Barf to conjure a cube fragment so they can do the same. In the face of the political themes of Secret Empire, I can’t help but notice Spencer’s fascination with A.I. Tony Stark. Captain America 25 opens with an almost-silent page of Tony trying to blow out a candle on his birthday cake. Later Tony tries to literally “have his cake and eat it too” by using the fragment to grant his birthday wish. It’s a moment that’s played for comedy but there’s gotta be more to it than that, right? I wouldn’t complain if Spencer decided to explore it in a future title — Iron Man or otherwise. The very idea of the two Captain America books colliding like this is fantastic. An issue that acts as the next issue of two different books, and as the grand finale of both character’s stories (at least, the part of the story not being told in Secret Empire). It is the sort of twist on the delivery of comics that sounds so great, that it is a shame that the issue completley fails to live up to… basically anything. Now, there is a strength, and it is Tony Stark. 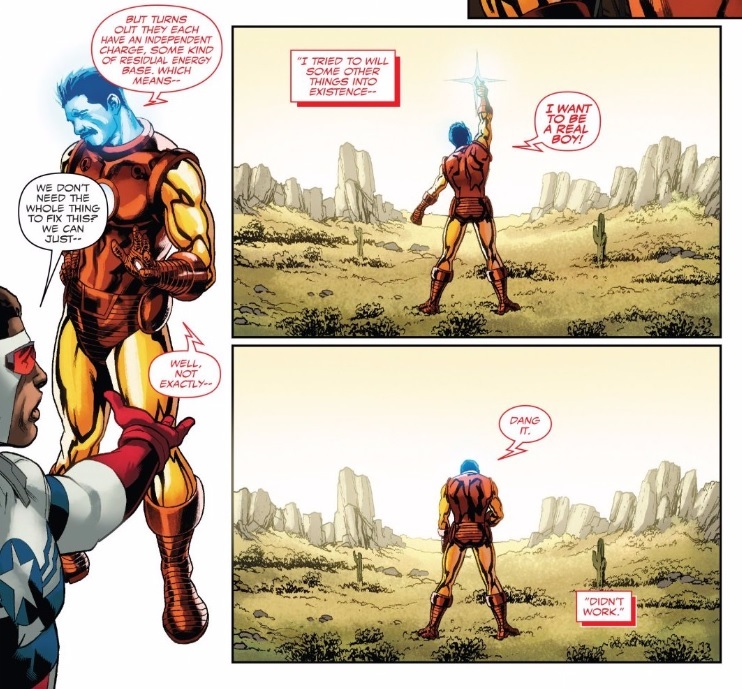 Somehow, in an issue that is similtaneously an issue of Steve Rogers and Sam Wilson, only Tony Stark seems to have anything of importance, an actual story. Ultimately, all Tony has is exposition. He is expositing on a detail that is interesting to learn about, but meaningless to the actual story itself (you know how Secret EMpire had a big thing saying to read this first? I ended up reading Secret Empire first, as when I was reading my comics, I had downloaded everything but Wolverine and this on my tablet. Readign this afterwards made me why anyone would care about order). But the fact that the TOny Stark stuff is just exposition doesn’t change the fact that it is really done well. It is so easy to mistake exposition for the dry recitation of facts, but it is anything that communicates facts. At the Tony Stark stuff is done is style. Beginning the issue with Tony trying to blow out his birthday cake is wonderfully odd and draws you in. And Spencer gets a lot out of the newly revealed mechanics of the cosmic cube. It is a simple idea, but a cool one. A small piece of a cosmic cube can massage reality, reorganizing events to achieve an outcome. Which leads to all sorts of great moments. Whether it is seeing the fun of the mechanics, like TOny receiving the birthday cake (note how what really makes that moment work is that despite being about the mechanics, it is rooted in the characters of the family), or the emotional realities that come alongside it, like how Tony is forced to grapple with his lack of humanity. WHether it is him wishing to be a ‘real boy’ or the simple fact that he wishes for a cake – the one birthday present that literally has no value to him at this moment. The only issue is using the cosmic cube to justify Steve Rogers not being killed by Miles. This feels like it exists to justify why Ulysses was incorrect in his prediction, but to suggest a cosmic cube was required to do so feels like overkill. It seems like everyone forgets hat the key idea of Civil War II was that knowledge of the future allowed you to change the future. You don’t need god level power. Because the fact that Steve was using that seriously undercuts the issue itself. What made MIles choosing not to kill Steve so powerful was how much effort Natasha and, to a lesser degree, Nadia put into making sure that Miles didn’t follow them down their dark path. To suggest that it was the cosmic cube massaging events undercuts the powerful choices being made. Still, this is the sort of story that SPencer should have been dedicating his tie ins to. It takes a small, meaningless but itneresting point, and it develops an entire issue around it. Really great Iron Man issue. But that’s the problem. THis is actually a Captain America issue, and the rest of it is just crap. The Steve Rogers like is sound and fury signifying nothing. ANd while there is pretty good political commentary you could wring out of that, it does not make a satisfying narrative. Spencer has discussed that one of the things he did for this event was create a bunch of things like DarkFOrce New York that existed to give other writers the space necessary to tell Secret EMpire stories, it is now quite clear that New Tian literally had no purpose. But more importantly, there is very little to the Steve ROgers stuff that is actually that meaningful. Meanwhile, the Sam Wilson stuff feels empty. Spencer has discussed how the point was that the moment the hero’s stop trying to win and start helping people, everything turns around. Which is a great theme, but there are problems. Firstly, why isn’t this in the main book, then? But more importantly, the scene doesn’t properly communicate anything. Like how they didn’t really save anyone, because the prison break was already occurring. I don’t want to call it a deus ex machina, because it quite literally isn’t. But things are a bit too convenient. Everything feels like they just fell into place. What sounds like it should be earned instead feels given. It makes the Sam WIlson stuff feel light and meaningless. Which is not what the return of Captain AMerica should feel like. And yeah, the reveal of Bucky worked much better in Secret EMpire 8 than it did in this issue. In that case, it created a powerful dramatic reversal that ended the issue in a strong manner. Here, it again feels artificial. Existing solely to set things up, while not working narratively. WHich is a shame, as Secret EMpire 8 proves you don’t need such artifical set up to make the scene work. So, the next Marvel event is going to be everyone fighting over Barf, right? Because damn, that is powerful. Even if he can’t make a full Cosmic Cube or Infinity Stone, the power to barf up Cosmic Cube shards has got to make him the most powerful superhero in the world, right? I mean, hell, if you had pictures of every Cosmic CUbe shard, couldn’t you mass produce Cosmic Cubes just by piecing them together again? That was another thing that weirded me out about this issue. While fully consistent with how Barf’s powers were previously presented, the power level displayed here was insane. You’d think there was some sort of cosmic artefact exception to his powers. It really didn’t help the sheer convenience of this issue that Barf literally has the power to replicate cosmic level artefacts. I don’t know if Barf was replicating it, though. When referencing Barf, Secret Empire 8 says that they found “the last fragment.” If Barf replicated a fragment, then there would still be another fragment out there. The “last” fragment, at least to me, implies that either the final missing piece of the Cube was waiting for Barf to puke it up all along, or that he somehow brought the last piece from wherever it was into himself when he puked it up. The start of Secret Empire made Barf’s power appear to be producing something new, but it is possible that what Barf actually did was transport an existing lunchbox and barf it up. And therefore, what Barf did could have been transported from its hiding place to Barf. The idea that the last piece of the cube was waiting for Barf to barf it up could be possible, but sounds weird. Considering Barf’s ability to barf things up is his powers, where was the cube before he barfed things up? But while the first explanation justifies Barf acquiring the cube fragment, reconciles things with Secret Empire 8 (though honestly, I would happily accept Sam using dramatic license to reconcile the two issues) and avoids the ‘mass produce cosmic cubes’ problem, it still creates a hell of a lot of weirdness. Surely Tony had photos of all (or at least some of) the cosmic cube fragments? Why only grab one fragment? If Barf can barf up a cosmic cube fragment, could they assemble a different cosmic cube? Or the Infinity Gauntlet? Doesn’t this mean that Barf has cosmic level powers, and why aren’t the heroes using him to greater effect? I think it’s in this issue (though it could be in SE 8), someone suggests that Barf couldn’t summon the fragments Steve already has. That’s obviously a rule of convenience, but maybe we can conceptualize with the logic of quantum physics. That is, the fragments exist in a cloud of possible places until they are directly observed. Steve’s had all been observed, so their locations were fixed (just as opening Schrödinger’s box to observe whether the cat is alive or dead collapses the quantum states that it is both alive and dead into one reality). We’ve seen plenty of magic that works in this kind of hand-wavy way (this reminded me in particular of the Mirror of Erised from the end of the first Harry Potter book), but I have to agree that this mechanic felt pretty cheap. There are obviously more character-driven ways Sam could have gotten that last fragment, but I think Spencer just wanted to put this gross-out gag at the center of his big summer event. To be fair, as much as I thought this issue was awful, I do like the idea of building such an important moment around a gross out joke. The idea that both levity and hope return at the exact same time is a great idea. Just wish it didn’t accidentally create a confusing and cosmic level powerset. It causes only problems and raises too many questions that distract from the narrative. And it does feel to cheap.